Four organisations in Trafford were recognised by Trafford Council, Trafford Partnership and local third organisations at the Trafford Quality Mark Event on Monday 9th March for their hard work, determination, passion and success in completing the Trafford Quality Mark (TQM) for their organisation. The TQM has been developed by Thrive Trafford working in partnership with BlueSCI, Trafford Council commissioners and procurement, and Trafford Clinical Commissioning Group (CCG). 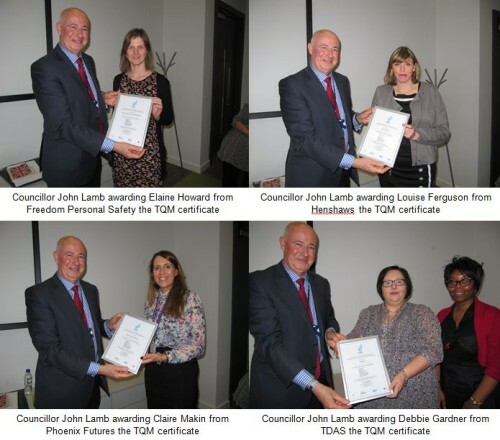 The TQM is a new approach for Trafford which aims to assist third sector organisations in becoming fit for purpose, more sustainable and better able to deliver high quality services. The TQM process takes organisations through an assessment and tailored package of support based around nine different areas including business planning, governance, and managing people, and is used to show that organisations are of a ‘recognised’ standard. TDAS, Phoenix Futures, Freedom Personal Safety and Henshaws where the four successful organisations completing the TQM working closely alongside Bernadette Elder, Thrive Third Sector Support Consultant. Reverend Roger Sutton (Chair of The Stronger Communities Partnership) and Councillor John Lamb (Council Executive for Partnerships and Communities) attended and supported the event, and highlighted how important and invaluable the TQM is for local organisations in an ever changing climate for provision of local services. Reverend Roger Sutton stated – “The Trafford Quality Mark helps to challenge views of the third sector and shows its level of professionalism..…this is what is needed locally; lots of groups want to develop up and they have the passion to do so in the third sector, I would encourage other groups to go through this process too”. A representative from each successful organisation attended the event and talked about how valuable and important the TQM process has been for them and their organisation, and outlined the positive benefits it could bring to other organisations in Trafford thinking of taking part. Elaine Howard from Freedom Personal Safety commented – “The TQM has changed how we work as an organisation, it has helped us progress from being grant reliant to winning contracts”. Click here to find out more information about the TQM.